This is a floor length banquet tablecloth for a 4' x 30″ banquet table. This linen is available only in white or black. All of our linen comes to you clean and pressed and the only items which could incur additional charges would be wax, burns, holes, or unusual stains. SKU: PFA40. Categories: Party & Event, Linens/Tablecloths, Banquet Linens. Tags: banquet linen, banquet tablecloth, floor length linen, floor length tablecloth, long tablecloth. This is a floor length banquet tablecloth for a 4′ x 30″ banquet table. This linen is available only in white or black. All of our linen comes to you clean and pressed and the only items which could incur additional charges would be wax, burns, holes, or unusual stains. This tablecloth is great for a card table or as an overlay to add color to virtually any size table! All of our linen comes to you clean and pressed and the only items which could incur additional charges would be wax, burns, holes, or unusual stains. This iridescent fabric produces a vibrant effect great for decorating any event! These tablecloths are also available in white or black each of which is rented separately. All of our linen comes to you clean and pressed and the only items which could incur additional charges would be wax, burns, holes, or unusual stains. 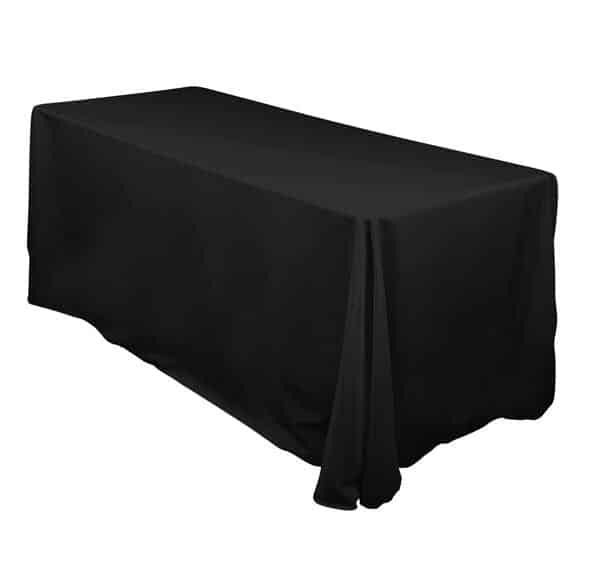 This is a standard size banquet tablecloth which will work on a 6′ x 30″ banquet table or an 8′ x 30″ banquet table and comes in a huge range of colors. All of our linen comes to you clean and pressed and the only items which could incur additional charges would be wax, burns, holes, or unusual stains. This is a standard size banquet tablecloth which will work on a 6′ x 30″ banquet table or an 8′ x 30″ banquet table and has a nice, formal look. All of our linen comes to you clean and pressed and the only items which could incur additional charges would be wax, burns, holes, or unusual stains.